prevent flare-ups like cradle cap or eczema. When you combine a great baby washcloth with warm water, quality baby wash, and soft, gentle toys, bath time can be a fantastic bonding experience for you and your child. Many parents say it is their favorite part of the day when caring for their newborn. The following are the best of the best when it comes to baby washcloths this year. These adorable baby washcloths come in soothing neutral colors like heather gray, blossom pink, sky blue, and cloud white. These best baby washcloths are made from 100% organic cotton, making them extra soft and true to the priorities of those who prefer natural products. Mommies & daddies love these washcloths because they are a perfect size for bathing, 8.5 by 8.5 inch. The washcloths come in a package of three and are a popular item for baby gift registries. Comprised of 100% organic cotton. The signature Burt’s Bees insignia design on the tag adds a nice designer touch. The edging can bunch up after washing, making them difficult to fold. These premium washcloths are made from organic bamboo that is durable, eco-friendly, and hypoallergenic. Bamboo is free of chemicals and is super absorbent. Many people also find that bamboo is softer than cotton and will not scratch or irritate the delicate skin of babies. 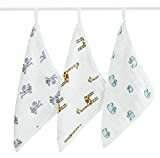 An added bonus of these baby washcloths is their antibacterial quality, perfect for getting babies extra clean in the tub and keeping germs at bay. 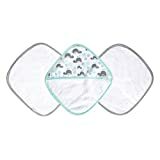 These are the best Matimati baby washcloths since they’re bigger than standard ones (10 by 10 inches) and could also be used in the kitchen for high chair meal time clean ups. These bamboo baby washcloths are sold in a set of 6 with 3 white and 3 light green washcloths, which makes them gender neutral and perfect for gift giving. Matimati Baby offers a 100% satisfaction guarantee on their products so you can try them risk-free. Just contact the company if you are not happy with the washcloths, return them, and they will refund your purchase. These washcloths are on many baby product top sellers lists. These are a larger size than standard baby washcloths. Matimati products are priced higher than some are willing to pay for baby washcloths. They are only available in green and white. This affordable product is popular for its practicality and longevity. Made from 80% cotton and 20% polyester, Spasilk 9 by 9 inches washcloths are sold in sets of 10. There are numerous color options in a variety of bright, fun designs like pink stripes, blue elephant, and solid yellow. Since they come in such a generous package of ten, parents also like to stash a few in diaper bags for emergency cleanups. It is also convenient to have so many on hand to avoid running out of washcloths, especially right when you need them. And they’ve also got matching hooded towel sets. These are very economical for those on a budget. There are many designs and colors to choose from. Some users say these washcloths are thin and flimsy. The color of these washcloths can fade after several uses. Recommended read: The right baby bath routine is essential for a healthy baby – check out the best baby bath seats! This popular brand is known for their use of 100% cotton muslin in their products. 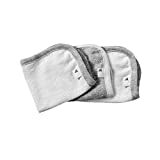 Their washcloths come in sets of 3 with an attached loop for easier drying and a nice look for the bathroom. The generous 12 by 12-inch size means that children and even adults can use these washcloths, or parents can use them as burp cloths. Another idea is to use them as small security blankets. The adorable, sophisticated patterns range from a blue “High Seas” theme with whales, water waves, and anchors to a neutral “Jungle Jam” print featuring giraffes, monkeys, and elephants. Aden & Anais products are unique because they get even softer after washing. This is a premium baby washcloth that is durable and well made with four layers of soft muslin. Durable and well made with four layers of soft muslin. The loop design makes it easy to hang these up to dry. This is a premium brand that might be too pricey for some. Some parents think this washcloth is too big. Recommended read: Since you’re here, you might also be interested in our collection of the best baby bath seats of the year! This unique 3-piece set features 2 baby washcloths and 1 bath mitt, all in white with a fun colored trim like aqua, gray, or pink. The bath mitt slips easily onto mom or dad’s hand for gentle cleaning. Bath mitts are very useful for washing baby’s hair without getting soap in their eyes. The washcloths and bath mitts are a standard size, 9 by 9 inches. 100% cotton and machine washable, the washcloths can also be ordered along with matching JJ Cole hooded towels. One of the few washcloth sets that come with a coordinating bath mitt. JJ Cole is widely available online and in several stores. Some users say the colored edging doesn’t hold up well after washing. These are five of the best baby washcloths right now for your little one. There is such a variety in design, color, material composition, size, and cost that every caregiver should be able to find the perfect product for their baby. What are some of your experiences with baby washcloths? Do you have a favorite or least favorite brand? How does having the best baby washcloth help you in your role as a mommy? Editor’s note: this post was first uploaded in October 2017 and has received multiple updates, including the most recent one in April 2019.